In Sweden there is a kind of decluttering called döstädning, dö meaning "death" and städning meaning "cleaning." This surprising and invigorating process of clearing out unnecessary belongings can be undertaken at any age or life stage but should be done sooner rather than later, before others have to do it for you. 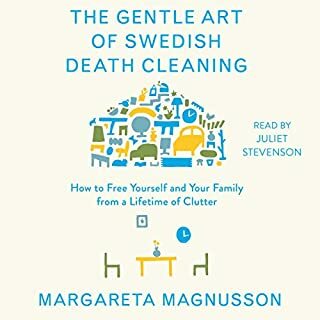 In The Gentle Art of Swedish Death Cleaning, artist Margareta Magnusson, with Scandinavian humor and wisdom, instructs listeners to embrace minimalism. 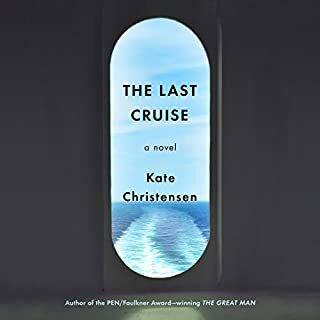 That the greatly admired novelist Kate Christensen has turned to the memoir form after six novels makes this book an event. Readers of memoirs of high literary quality, particularly those with food themes - most conspicuously Ruth Reichl's Comfort Me with Apples and Gabrielle Hamilton's Blood, Bones, and Butter - as well as admirers of M. F. K. Fisher and Laurie Colwin will be a large and eager audience. I grabbed this book as soon as I heard an interview with the author on NPR. Based on that, I wanted to read anything by Kate Christenson and thus I was expecting a much more introspective exploration of her life. 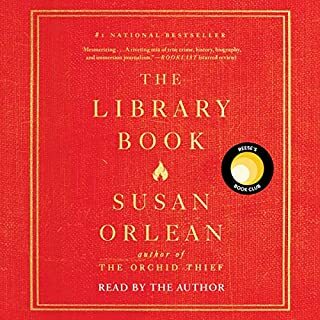 What I got instead was an extended list of unexamined life experiences, rendered factually and sounding totally banal by the narrator's sing-song-y voice. 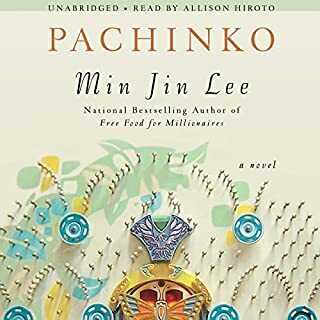 Every event, situation, item in the physical environment was made to seem oh-so "precious", with unnecessary detail which after a few chapters became just tiresome. Perhaps in the hands of a less chirpy narrator, this book would have more heft and substance. 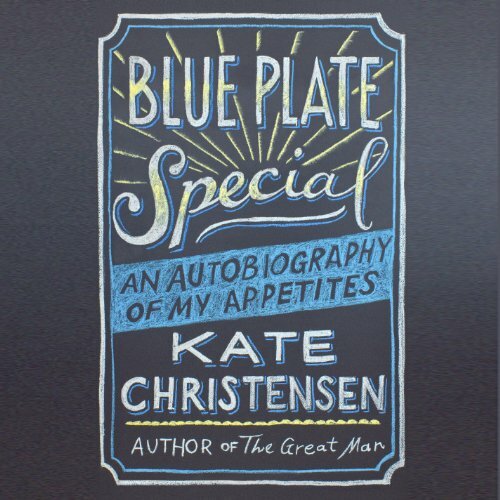 But performed as is, "Blue Plate Special" is the new "Eat Pray Love", with the same shallow, self-referential descriptions that make it a picaresque pseudo-adventure for the privileged. Actually, the "I", Kate, the narrator of this memoir is not nearly as interesting as her mother, with her multiple marriages, breakdowns, struggles and angst, and the listener only gets a random flash of her as background noise. Sometimes I kept reading just for the purpose of finding out more of what was going on with the mom in the story. I can't say that this book is ruined by the narrator (although for me it was), or simply that IMO Tavia Gilbert's birdsong reading gives a shallow rendering to what might be an interesting life. Might read better in print. I'll give it a "3", though, because it satisfies one of my basic standards of read-worthiness: it's entertaining. 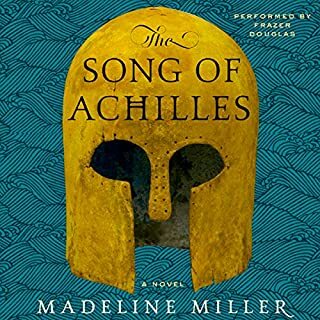 Compelling in lots of ways, from start to finish. What made the experience of listening to Blue Plate Special the most enjoyable? Kate Christensen has a lot of unique experiences growing up in various parts of the country (under various conditions) and later Europe, with unusual parents and extended family. She has a front row seat for some pretty exceptional experiences: living in France, the Iowa Writer's Workshop and working in NYC in the late nineties while living in pre-gentrified Williamsburg. 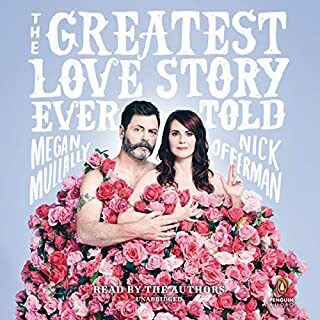 Her voice is genuine and charming and I couldn't stop thinking about her when I wasn't listening.The only distraction is the narrator's voice, which has an affected, overly-respiratory breathiness that reminded me of an "I can't Believe it's Not Butter" commercial. You can get past it though, easy. Just would have been cooler if she'd read it herself. Reminded me lots of Blood, Bones and Butter.